Argentinian earth magnetosphere satellite. Microsat. MuSat-1 Victor was the first Argentine-built satellite. AKA: Victor. Status: Operational 1996. First Launch: 1996-08-29. Last Launch: 1996-08-29. Number: 1 . Gross mass: 32 kg (70 lb). Measuring 340 x 340 x 450mm. "Victor " was an experimental vehicle, intended to evaluate in-orbit behavior of low-cost space technologies. It carried two video cameras, oriented for earth-imaging, as well as transceivers in both UHF and S bands. The beacon could be heard every 90 seconds at 137.95 MHz as a brief burst of CW ("Hi hi de MUSAT"). Electrical power was provided by four 88-Si cells solar panels, with an end-of-life electrical power of 8 W. Its position was determined by means of a 3-axis, flux-gate magnetometer, as well as both solar and horizon sensors, while its attitude was 3-axis controlled by magnetic coils and reaction wheels, with a pointing precision of 0.5 deg. MuSat-1 was developed and built by a 25-person team at the Instituto Universitario Aeronautico, under the sponsorship of the government of the province of Cordoba, in a 3.5 year, $1.2 million effort. Family: Earth, Magnetosphere sat. Country: Argentina. Launch Vehicles: R-7, Molniya 8K78M. Launch Sites: Plesetsk, Plesetsk LC43/3. Agency: Cordoba. Bibliography: 2. 1996 August 29 - . 05:22 GMT - . Launch Site: Plesetsk. Launch Complex: Plesetsk LC43/3. LV Family: R-7. Launch Vehicle: Molniya 8K78M. 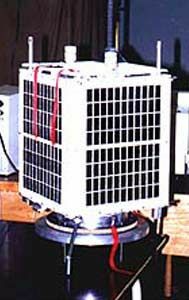 Microsat - . Payload: Victor. Mass: 32 kg (70 lb). Nation: Argentina. Agency: Cordoba. Class: Earth. Type: Magnetosphere satellite. Spacecraft: MuSat. Decay Date: 1999-11-12 . USAF Sat Cat: 24291 . 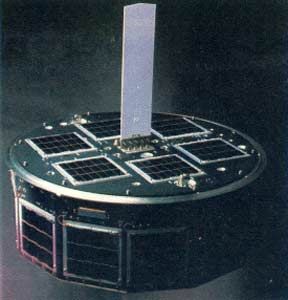 COSPAR: 1996-050A. Apogee: 19,176 km (11,915 mi). Perigee: 804 km (499 mi). Inclination: 62.80 deg. Period: 94.70 min. MuSat-1 Victor separated from the launch vehicle at 05:31 GMT, becoming the first Argentine-built satellite. Measuring 340 x 340 x 450mm. "Victor " was an experimental vehicle, intended to evaluate in-orbit behaviour of low-cost space technologies. It carried two video cameras, oriented for earth-imaging, as well as transceivers in both UHF and S bands. The beacon could be heard every 90 seconds at 137.95 MHz as a brief burst of CW ("Hi hi de MUSAT"). Electrical power was provided by four 88-Si cells solar panels, with an end-of-life electrical power of 8 W. Its position was determined by means of a 3-axis, flux-gate magnetometer, as well as both solar and horizon sensors, while its attitude was 3-axis controlled by magnetic coils and reaction wheels, with a pointing precision of 0.5 deg. MuSat-1 was developed and built by a 25-person team at the Instituto Universitario Aeronautico, under the sponsorship of the government of the province of Cordoba, in a 3.5 year, $1.2 million effort.